Oxfam America is today one of 20 Oxfam affiliates, a global confederation working in over 90 countries. They create lasting solutions to protect human rights and reduce hunger, poverty, social injustice. Oxfams take on big issues: inequality, discrimination, and unequal access to resources including food, water, and land. 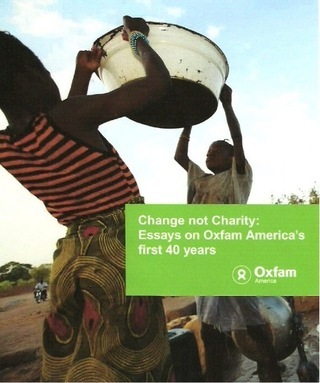 But Oxfam's start in America in the 1970s was shaky. Alarmed by civilians starving in Nazi-occupied Greece, a group of Oxford academics, social activists, and Quaker intellectuals defied Great Britain's Foreign Office in 1942 to form the Oxford Committee for Famine Relief to ship food through the Allies' naval blockade. After World War II, Oxfam continued sending material and financial aid to poor people throughout Europe. After Europe recovered, Oxfam shifted to helping people in developing countries. In 1970, Washington, D.C., volunteers responded to the humanitarian crisis of Bangladesh's Liberation War, and, assisted by Oxfam Great Britain, started Oxfam America. But after the flood of donations receded, it moved in 1973 to start again in Boston, where a Unitarian Church offered a free basement room for its small staff. It attracted a small local Board of Trustees, of which I was one. Most of us had served in the Peace Corps. And several had served in East Pakistan or Bangladesh. We resolved that fund-raising appeals would avoid condescending to people in distress; appeals should be educational and thought-provoking. Our 1974 experiment with Thanksgiving "hunger banquets," titled Fasts for a World Harvest, succeeded. Oxfam's annual Fasts continue today as one of America's largest anti-hunger campaigns. But, however exciting, the mid-1970s were also nerve-wracking years for our small staff, board members, and volunteers. We did everything—including selling holiday cards and dish towels outside Filene's Boston department store—to meet payroll and fund our budget for overseas grants. Although rich in creative ideas, we were ragged in teamwork and execution. Since I worked with a management consulting firm, I was elected Board Chair and asked to lead efforts to improve Oxfam America. I report the story and our results in Chapter 2 of our early history, Change not Charity. Oxfam America chose the slogan "change not charity"
to distinguish its approach from that of more mainstream development agencies, and to declare its focus on changing the structures perpetuating poverty rather than simply giving handouts. First, neither seek, nor accept, funds from government agencies or large donors. Third, avoid raising funds solely for disaster relief, but focus instead on community-based development projects. Fourth, avoid setting up overseas offices to distribute and manage grants, both to reduce costs and to increase grant funds for others. Instead, distribute funds through partnerships with the best indigenous community-driven non-government organizations (NGOs) in developing countries. Fifth, focus our grants on small projects, both to strengthen the capacities of our partner NGOs and to serve as models for others. 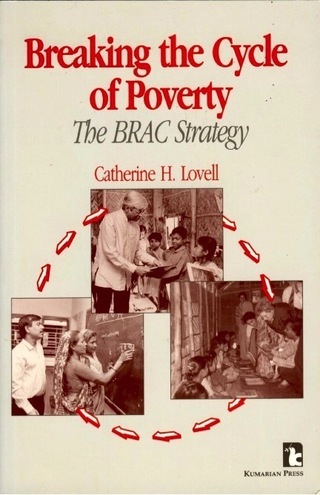 One early partner was a start-up NGO we knew in Bangladesh, BRAC. We decided on two grants to help BRAC start its first women's program and its first training and resource center. Today, 115,000 BRAC staff work throughout Bangladesh and in 10 other countries, making BRAC one of the world's largest development NGOs. Our planning required two years, but made us an effective team. Our results attracted an experienced Executive Director, Dr. Joseph Short, who led us in exceeding our first ambitious goals. We became independent of Oxfam Great Britain, financially and administratively. Even today, Oxfam America's website history page cites this story. These principles continued to guide Oxfam America's growth. In 1974 our four-person staff handled revenues of $176,692. In 2016, 330 staffers managed $79.5 million in revenues, of which $71.4 million or 79.5% was delivered to tens of millions of people through four programs — overcoming poverty and injustice, emergency responses to save lives, campaigns for social justice, and public education. Oxfam America's educational efforts expanded into robust policy research and advocacy. Field experience taught it how policies, laws, and institutions influence perpetuating and relieving poverty. To develop a voice for policy and legislative debates in Washington, D.C., it created the separate Oxfam America Action Fund, a 501(c)(4) advocacy agency similar to the Quakers' Friends Committee on National Legislation. Similarly, the Oxfam confederation in 1995 created a separate agency, Oxfam International. It coordinates the efforts in 90 countries of now 20 affiliates. Its Secretariat in Oxford UK researches and lobbies for improved policies through its offices in Addis Ababa, Brussels, New York, and Washington, D.C.
Oxfam America's advocacy evolved naturally from education experience at home and field experience abroad. Notable campaigns during President Ray Offenheiser's 20 years included: building the fair trade movement through networks of faith and student groups, persuading Starbucks to support fair trade sourcing and pricing, persuading big pharmaceutical firms to provide life-saving drugs to millions of HIV-AIDS patients, and getting essential food supplies into mountainous Afghanistan during the height of the U.S. invasion. Oxfam America's new President, Abby Maxman, brings over 25 years of experience in international humanitarian relief and development, starting as a Peace Corps Volunteer and then in senior officer roles with CARE.